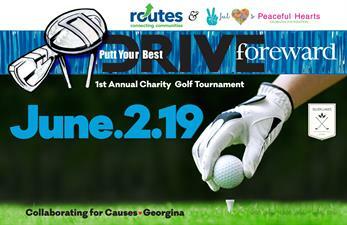 Shotgun Start @ 9:00 a.m.
1st Annual Charity Golf Tournament benefiting Peaceful Hearts Georgina Foundation and Routes Connecting Communities. Peaceful Hearts Georgina Foundation is a charitable organization that provides Flex-Model day programs for a diverse group of special needs children, youth & young adults aged 6-29 years since January 2019. Routes Connecting Communities is a York Region community based not-for-profit organization dedicated to helping people get to where they need to go since 1988. Our services provide people dealing with life challenges timely, safe, affordable and compassionate transportation.